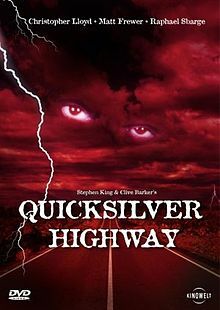 I recently saw the movie Quicksilver Highway. Never heard of it before, it just randomly popped up when I was searching for DVD’s to add to my Netflix queue. When I looked up the description I instantly knew I had to see it. The movie is a two part film adaptation of two of my favorite short stories. Chattery Teeth by Stephen King and The Body Politic by Clive Barker. I read these two gems a few years ago and they’ve always stayed with me. The movie has kind of a Creepshow vibe to it considering it’s one film with two separate stories. 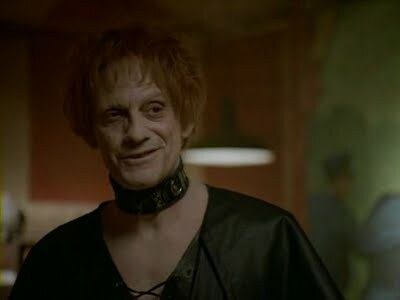 And the best part is: Christopher Lloyd plays the narrator! That was the icing on the cake for me. He’s dressed in gothic attire and has orange hair in the movie. That’s all that can be said about that. I can’t say the film versions did the stories justice, but still a great film nonetheless. Especially if you like bad movies as much as I do. I just recommend reading the stories first if you’re a fan of King and Barker.